In this Markets.com Review, you will find out everything worth knowing about the popular broker and their real trading, and demo account. Markets are one of the most well-known and respected names in the forex industry and in the UK. It’s a broker that offers premium forex trading and access to CFD trading on thousands of underlying assets. To us, a big plus is that they have started focusing on cryptocurrencies. On top of UK, Markets.com is offering their services to EU based traders and to many other countries globally. Chances are that you have heard about Markets.com before even if you’re not into trading. If you’re a sports fan you probably recognize them as one of the official sponsors of the English football team Arsenal. Otherwise, you might have seen their TV-commercials or ads and banners online. We have been using Markets.com for years and would like to take this opportunity to share our experience with them, while at the same providing you with an unbiased review of their product and services. We are about to start this Markets.com review so buckle up and enjoy the ride. There is no doubt that Markets.com belongs to an exclusive group of top brokers for forex and CFD trading. They have created a brand and a business that very few can even dream of competing with. Markets.com has always raised the bar for the industry making sure that we as customers get the conditions and services we deserve. Their product is very good, and it is with the utmost confidence that we recommend Markets.com to everyone who’s looking to trade currencies. We have used them for years and have nothing negative to comment on, which is a very rare rating to get from a group of picky guys who spend all day reviewing trading services online. Markets.com trading platforms and trading app. What type of trading accounts do they offer? any demo account? What financial instruments can you trade with the broker? We thought it would be a good idea to start by answering the most important question first: Is Markets.com a scam? The answer is simple and straightforward, Markets.com is not a scam, it’s a reliable service. In fact, at a time were unreliable trading services and brokers keep flocking to the market, Markets.com acts as a role model for brokers who are trying to offer a good product with fair terms. Markets.com is run by a company called Safecap that was acquired by Playtech PLC a few years ago. What’ were saying is that Safecap is a subsidiary of Playtech PLC, one of the leading game and software developers in the online gaming industry. Playtech is a company with a long history and hundreds of thousands of happy customers and they are quoted and traded on the London Stock Exchange. If that is not enough to convince you that Markets.com is a legit service and not a scam, they also have licenses from CySEC (Cyprus Securities and Exchange Commission) and FSB (South Africa’s Financial Service Board). 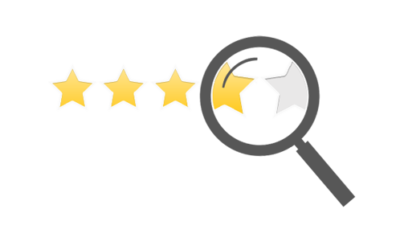 Additionally, Markets.com has an immaculate reputation and we have struggled to find negative reviews about them online. Most of the bad rep they’ve gotten is from users who are upset that they lost money and are now trying to blame it on Markets.com. However, we can surely conclude that Markets.com is not a scam. In fact, it’s one of the most trusted brokers out there. Together with a few big names such as Plus500 and eToro. Is Markets.com available in the United Kingdom? Yes, Markets is available in the UK, and in fact, they are one of the biggest brokers available in the UK. They are also the main sponsor of Arsenal, a UK based football team and one of the most known clubs in the entire world. Furthermore, they are also available to most Markets in Europe, and countries globally. If you are unsure if the trading platform is available to you, you can always head over to their website and check. Markets.com is available for UK and EU traders. Markets.com is NOT available to US clients. 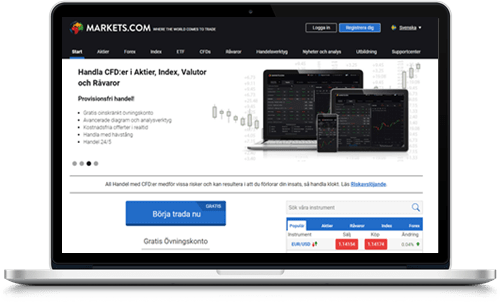 In the CFD and forex industry, Markets.com is one of the most well-established brokers with a great overall reputation with other brokers and traders. For us here at BullMarketz.com, Markets.com has played an important role in our trading careers, and we still prefer using Markets.com over many of the other leading brokers. Markets.com has a combination of trading platforms. The main one is their own and quite a new platform and the second one is MetaTrader 5 which is the preferred choice of thousands of traders. The MT5 is not developed by Markets.com which means the broker has been able to put some of its efforts into developing other parts of their business aside from a trading platform. In addition to being well-established and appreciated for their services, Markets.com has also been awarded several very prestigious prizes for the products and services they provide. In fact, Markets.com happens to be one of the most recognized and awarded forex brokers in Europe. Just like all the brokers that we recommend, Markets.com is 100% regulated and licensed to offer their services in Europe and beyond. We can’t emphasize enough how important it is to only use regulated brokers when trading forex and CFDs, otherwise, you will expose yourself to too much risk. Markets.com is avalible in the UK via its FCA license, and in the EU via its CySEC license. Markets.com offers a demo account that you can use to trade all the available assets in a risk-free environment. We always recommend that our readers sign up for a Markets.com demo account since that is the only way you can check out the broker before you sign up and deposit your money. One of our favorite aspects with Markets.com is the stability and accessibility that their trading platforms offer. It doesn’t matter what device you like to trade on since Markets.com’s products are available on anything from smartphones and tablets to computers and browsers. Markets.com has also put a lot of effort into customizing their tools to be as user-friendly as possible. Nothing that Markets.com offers feel excessive since every tool and service fills a very specific purpose for their customers. We want to emphasize that you can feel completely safe if you open a trading account with Markets.com. They will do everything they can to make sure that you have a smooth trading experience without any issues. Needless to say, Markets.com is the first-hand forex broker choice for us at BullMarketz.com as well as thousands of other customers. 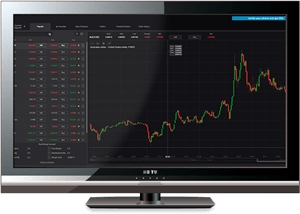 Market.com’s main trading platform used to be the renowned MetaTrader 4 but in order to offer access to more markets they now offer access to Metatrader 5. The platform was not developed by Markets.com but is offered by a third party company. This means that Markets.com is not the only broker associated with MT5. In fact, MetaTrader 5 is so popular among currency traders that we are expecting that it will soon be considered industry standard. Today, there are more leading brokers that use MetaTrader 5 than there are brokers with exclusive software. Market.com’s version of MetaTrader is a no download platform called the WebTrader. The WebTrader platform is clean and easy to use version of the MT5 and it no longer has limited features compared to the desktop software. According to Markets.com it is compatible with all browsers and operating systems. We have tested it on Google Chrome, Firefox, and Safari on both PC and Mac, and can confirm that it works. Markets.com also offers several analytic tools that help make it easier for you to develop strategies and make well-informed decisions about your investments. Head over to Markets.com if you want to learn more about MetaTrader or any of the other tools. In order to further broaden their reach, Markets.com has recently developed its own proprietary platform that they offer in combination with MetaTrader’s tools. Their platform is well-designed and exciting to use, and every process has been limited to as few clicks as possible which makes the trading experience incredibly smooth. In today’s day and age, it is getting more and more common for individuals to handle their currency and CFD-trading on mobile devices. It did take a few years for the industry to adapt to this new technology, but nowadays there are quite a few good mobile trading platforms on the market. Markets.com offers a dedicated trading app that they developed in-house, for Android, iOS (iPhone, iPad), and mobile Windows devices. It’s a practical app that allows you access to monitor all your on-going trades no matter where you are. The app can also be used for easier analytic work and trading signals. Just like all other mobile forex trading apps, Markets.com’s MobileTrader is limited compared to both MetaTrader and their own computing platform. The problem is that technology is developing too quickly and companies like Markets.com have no chance of keeping up. Although, during the last two years more brokers have started focusing on mobile-friendliness and we are expecting to soon see trading apps that outperform regular desktop software. Unlike some other leading brokers, Markets.com has chosen not to offer several different trading accounts based on turnover, deposit amounts, and trading styles. Instead, they offer an extensive trading account and an unlimited Markets.com demo account. A demo account is sometimes called a practice account, and it is exactly what it sounds like. It is an unlimited trading account that offers you the possibility to develop strategies and test trading techniques with virtual money. With a Markets.com demo account, you can trade currencies and CFD on Markets.com’s regular platform without risking your own money. Also, demo accounts are not only for beginners – experienced traders like ourselves use them all the time. Trading in a risk-free environment allows you to take more risk and try new assets. Because of this, we always recommend a demo account to everyone who is serious about their trading. You have nothing to lose, literally! With a Markets.com trading account, you get access to all the tools and services across all the platforms. There are several features to help you analyze the market and set your own trading signals. You can also create your trading robot and trade automatically based on predetermined settings. Today, Markets.com is not offering any bonuses or offers, and they don’t have a VIP-account. However, they are usually eager to treat loyal customers with exclusive deals and events. If you feel like you’ve spent a little extra lately, you can contact their customer service and ask if they have anything to offer you. Who knows, maybe you’ll be treated to something really nice! The main difference between a demo account and a real account is that the demo account is 100% risk-free since you are not trading with real money. Instead, Markets.com provides you with virtual money that can be used to trade under real market conditions. There are two main benefits of having a demo account. It’s great for beginners that need to practice trading before they sign up with a regular account and start risking their own money. By training on the platform before you start trading, you’ll learn what it feels like and how the different features work which will give you an advantage when you finally start trading with real money. A Markets.com demo account can also be used by experienced traders that want to test new strategies and techniques. Developing investment strategies can be a tedious task, and since it often requires some trial and error, it quickly becomes expensive, unless you use a demo account with virtual money. Because of these two aspects, we recommend that everyone at least tries using a demo account at some point. You literally have nothing to lose! Besides all of the opportunities a demo account offers, there are some downsides, especially psychological. Humans tend to be more careless when spending fake money since their actions don’t have any real consequences. In the worst-case scenario, this could lead to people being reckless with their own money when they switch from demo to regular trading. This is especially true when using leverage. Adding a 100:1 leverage on a prediction for a currency pair you’re not completely convinced about, is fine when you are trading with virtual money. But when it’s your own money you need to be more careful since 100:1 leverage has the ability to cause some financial damage to your balance. Because of this urge, you need to be extra careful when you make the switch and try your best to use your demo account as if you were trading with your own money. In our opinion, Markets.com offers two of the most exciting and rewarding markets there is. Forex trading and CFD trading are widely popular around the world. In fact, the forex market is the single biggest market on the planet. Forex – Markets.com offers access to over 50 unique currency pairs, and even though that might not sound like much, we guarantee that it is an impressive number. Compared to other forex brokers 50 currency pairs is a lot. In addition to the currency pairs, Markets.com charges no fees and gives you super tight spreads on many of the world’s leading currencies and exchange rates. You also have the opportunity to use the leverage of 1:300. Leverage is a feature that gives you huge advantages since you only have to invest a fraction of the actually invested amount. Just be careful, leverage also adds to the risk and you might end up losing money that you never invested! Have you still not tried currency trading? Then it is about time that you sign up and deposit some money with Markets.com. CFD – CFD stands for Contract for Difference and it is a speculative form of investment where you bet your money on underlying market movements. Your task is to predict how the price of an underlying asset will move and then buy a contract (CFD) based on that prediction. A good way of explaining CFD trading is that you invest without owning. Instead of buying an actual asset or security, you invest money in a prediction of in which direction the price of the asset will develop. Due to this, CFDs can also easily be traded on downward movements which naturally creates twice as many opportunities as other forms of trading. For example, regular stock trading only works on upward market movements and requires you to short sell to make money on falling prices, with CFD trading it’s much easier. 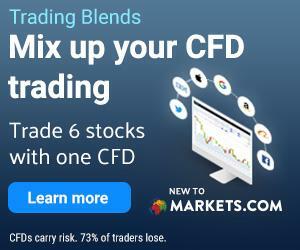 Markets.com’s selection of CFDs is even more impressive than its selection of currency pairs. At the moment they offer more than 2,000 stocks and indices, as well as 15 of the most traded commodities. With a huge selection like that there is no doubt that you will find something that fits your preferences. The latest addition to Markets.com’s selection of assets is cryptocurrencies. The 6 digital currencies can be traded as CFDs and not as actual coins as you would from a cryptocurrency exchange. But don’t worry, there are many benefits of trading and using a broker for cryptocurrencies as CFDs. Currently, Bitcoin, Bitcoin Cash, Ripple, and Ethereum, as well as Litecoin and Dash can be traded at Markets.com. No one is more excited about this than us. We have been interested in cryptocurrencies since Bitcoin was first launched, and the fact that our favorite broker now offers digital currencies is really a dream come true. The following instructions cover the process needed to register a real trading account with Markets.com and you should know that opening a Markets.com demo account is much easier. The registration process for CFD brokers is mostly controlled by the regulatory bodies that have licensed the broker and not so much the broker itself. Because of this, the registration process is almost identical to every broker that we have recommended. Despite that, we will walk you through the process to make sure you know what is needed from you before you get started. In order to be as clear as possible, we have divided the registration into four separate stages. The first step is to provide Markets.com with information about yourself. They will ask you to submit your name, address, email, phone number, etc. At this point, you will also have to decide on a password for your account, and even though you could change it in the future it needs to be something safe. The password should be unique since you will start depositing money and making profits on the platform and wouldn’t want someone to be able to break into your account. After you’ve submitted the information, you can proceed with the next step in the process. Remember that you will have to confirm all the information later on so it needs to be correct. Markets.com will have to evaluate your understanding of trading, leverage, CFDs, the forex market, as well as other basic economic concepts. The only way for them to do that is to test you with a quiz. The test consists of a number of questions regarding trading, and your answers will be used to determine how much leverage you will be offered and if any limitations will have to be implemented on your account to protect you. It’s a short test which you can easily complete in under 10 minutes, and as soon as that’s done, you can start verifying yourself. Note that you will be able to use the demo account at this point if you’d like. Before Markets.com can start offering you financial services they are obligated to confirm that you are who you say you are. This is done with an identity verification process, and it requires you to provide at least two documents. You will have to take a copy of your passport, driver’s license, or national ID and send it to Markets.com. The copy needs to be in color, and it must have all the important information clearly visible on it. You will also have to submit a recent utility bill that is no older than three months or a bank statement. It’s important that this document shows your full name and address on it. Normally, no other documentation is needed to confirm your identity, but Markets.com has the right to ask you to provide more information as they see fit. Also, in some cases, it can take Markets.com a few days to actually confirm your identity so we suggest you start the process as soon as you can. As soon as Markets.com has verified your identity and confirmed your registration, you are allowed to start trading, but first, you need to fund your account. There are several payment methods to choose from such as credit and debit cards, PayPal, Neteller, bank transfers, etc. Markets.com requires every new user to deposit at least £/$/$ 100 in order to fully activate their account. This is called a minimum deposit, and Markets.com’s is lower than a lot of other options. Choose the one that you prefer and deposit the amount you have planned to use for trading. If you’re depositing money with a credit card, you will have to confirm the card. This is done by sending in a copy of the front and back of the card, covering all but the last four digits and the security code on the back. That’s the last step, and as soon as your money has been transferred, you can start trading! As a leading forex broker, Markets.com has to offer leverage, otherwise, it would be nearly impossible to make any money from trading with them. The price changes of currencies are subtle, and without leverage and margin, you would need to invest tens of thousands of dollars on each trade. In short, leverage is a way for Markets.com to help you get more exposure to your every investment. The way that this is done is by the broker offering to match or increase your invested amount in exchange for a small fee and a promise that you pay back the borrowed money as soon as you close your position. This system is highly effective in increasing profits in any market, but it also comes with additional risk so you need to be careful. Also, we advise everyone that is new to leverage trading to educate themselves on the subject before they start. What is like to use Markets.com’s services? In our opinion, Markets.com has one major issue with their product, and that is their website. You see, they use the MetaTrader 5 as their main trading platform in combination with their own trading tools, which is a great decision that we’ll talk more about in a second. However, their front-end solution is not optimal. The design and colors are quite standard for the industry and it’s similar to some of their competitors. The problem has to do with the navigation which is really hard to understand as well as the fact that the website is slow and feels cheap. We have also found a couple of empty pages, and when looking for specific information, it can be hard to know where to go. Also, as Swedish natives, we have to say that the translations are subpar at best and certain buttons are in German and Spanish instead of Swedish. That being said, as soon as you initiate the registration process, everything changes and the poor front-end solution is replaced with a cutting-edge back-end solution. As mentioned, the MetaTrader 4 and 5 are our favorites, and we always appreciate when brokers choose to offer them, but what really makes Markets.com’s product unique is their analytic tools. Note that Markets.com does not have a downloadable platform instead all trading is done online, or on a mobile device, which is practical. In addition to the MetaTrader platform, Markets.com offers its own trading platform that is really easy to use. It’s relatively new, and it’s called the Markets.com Trader. According to the broker, a lot of effort was put into creating a platform that required as few clicks as possible to perform each task. This has resulted in a very fast and streamlined product that we instantly fell in love with it. As if that wasn’t enough, Markets.com offers several advanced charting tools and investment advice from experts. For example, when we last checked Markets.com provided insight tips for stock traders directly from Deutsche Bank as well as their own indicators for commodities, cryptocurrencies, and the FAANG stocks. Combine that with MetaTrader’s analytic tool Trading Central, and you have all the data you need to start trading. The current trading app offered by Markets.com was developed in-house, and we are deeply impressed with how good it is. In the last couple of years, mobile trading has developed so rapidly that it now feels like it’s easier to trade on a smartphone than it was to trade on a computer five years ago. The mobile platform is available on iOS and Android and works just as well on smartphones as it does on tablets and iPads. It gives you access to all the tools and features you need to trade. We are very pleased to announce that Markets.com’s mobile platform is one of the most innovative platforms that we’ve tried and we are certain that this broker will help lead the market forward. Markets.com is run by a financial service company called Safecap Investments LTD. They have a license from the Cyprus Securities and Exchange Commission (CySEC) who also regulates them. Markets.com’s license number is 092/08 and it gives them permission to offer their services to customers in most of Europe. They also have a license from the Financial Service Board (FSB) in South Africa under license 43906. The Cyprus Securities and Exchange Commission (CySEC) is hard to obtain for brokers today so the fact that Markets.com has this license is proof that the broker can be trusted. And to add to this, Markets.com has a good reputation online and among its traders. Please note that Markets.com is limited in certain jurisdictions including the United States, Japan, Canada, and Belgium. If you become as popular as Markets.com, you need to offer your customers practical solutions to all their problems. If a customer is not happy with the product or service he will turn to a competitor. To avoid this, Markets.com always makes sure to provide the best payment methods. The following payment methods are available for most of Markets.com’s customers. Additionally, there are a few smaller local options depending on where you live. We have some good news. Markets.com has one of the easiest fee systems in the industry, and they are very eager to make sure that all charges are as transparent as possible to their clients. Not only that, but Markets.com is a commission-free broker that does not charge any additional fees for trades performed on their platform. Instead, all the charges are included in the spread. Markets.com does not charge a commission as some other brokers do. In our opinion, it’s the most honest way of operating a CFD and forex broker. Compared to other industry-leading CFD brokers, Markets.com is very reasonable with their fees. As mentioned, the broker does not charge anything for regular CFD and forex trading, but there are what is called non-trading fees. If you decide to hold a position for longer than the market is open, Markets.com will charge you an overnight fee. This is standard practice in the business and something every broker does, and the beauty is that it can be easily avoided by selling your positions before the day is over. Other than that Markets.com does not charge any fees. We know that it’s become increasingly more popular to charge financial fees for withdrawals, inactivity, etc. but Markets.com does not. All that being said, Markets.com has to make some money and that is done via spreads. A spread is the difference in sell and buys price, and it’s charged by every broker that we have ever come across. It’s a way for brokers to be able to run their business and handle all their clients. In some ways spread is a different word for brokerage fee. On many assets, the spread is a bit higher than other brokers, but considering the fact that Markets.com is commission and fee-free, their spread is super fair. These are definitely not devastating prices, but it can add up after a while. Also, depending on what assets you’re trading, there could be cheaper alternatives out there. The Markets.com customer service is available in 20 different languages and they have been awarded several prizes for their great service. We have been in contact with them on a few different occasions and have always been very pleased with the help we’ve received. Phone – Their phone support is open 5 days a week and they have a list of local phone numbers on their website. Live chat – Support through chat is available on their site and it is open all day and night. Email – You can contact Markets.com by emailing them. Note that this service is not available on weekends and holidays so depending on when you write them, you might have to wait a few days to get an answer. Post/Fax – It is also possible to send a letter or fax to Markets.com. For minor issues, we recommend that you first take a look at our FAQ that we’ve posted below. In it, we answer some of the most common questions about Markets.com. If you don’t find your answer there, you can continue to Markets.com’s own comprehensive FAQ where they have answered the most common questions they get asked. The FAQ section has a practical search function that makes it easy to find what you’re looking for. We don’t suggest you contact Markets.com directly until after you have reviewed their FAQ or unless you have an urgent problem and need quick assistance. As mentioned, Markets.com is a broker and a brand that is owned and operated by Safecap. Safecap is a financial firm that is based in Nicosia, Cyprus, Cyprus is a full member of the European Union. Market.com’s headquarters are located at 148 Strovolos Avenue, 2048 Strovolos, P.O.Box 28132, Nicosia, Cyprus. A few years back, Safecap was acquired by Playtech PLC, one of the largest casino game developers in the world and it’s traded on the London Stock Exchange. Playtech was founded in Estonia in 1999 but moved its headquarters to England shortly after that. Today, Playtech’s headquarters are located in Douglas, Isle of Man. We strongly believe that Markets.com could be the single most awarded CFD and forex broker of all times. They continually get recognized for their platform, dedication to being an innovative leader, and their amazing customer relations. Most recently, Markets.com received Best Forex Trading Platform and Best Forex Provider at the UK Forex Awards in 2017. That is one of the most prestigious awards that a forex broker can receive and a truly incredible feat. Other important awards are the Best Broker in Customer Service Europe from Global Banking & Finance Review in 2012 as well as Best Customer Service also in 2012 at the London Investor Show Forex. By the looks of it, Markets.com is getting ready to gain some serious recognition for their proprietary platform, and we think they more than deserve it. In the section below we’ve answered some of the most common questions about Markets.com and their services. The question includes those that have been set to us but also other questions that we’ve seen around the web. Please leave a comment on this page if you have a question that you can’t find the answer too and will help you as soon as we can. Markets.com is forex and CFD broker with an impressive global reach. In fact, their slogan is “Markets.com – Where The World Comes to Trade,” and we think that’s a fitting statement. The broker is operated by a company called Safecap and in 2016 Safecap was acquired by Playtech – a giant in the online gambling and game development business. So today, Markets.com belongs to an extremely influential online empire. How does Markets.com make money? Markets.com is actually completely free of commission and almost completely free of fees. There is only one fee charged by Markets.com, and that is an overnight fee that you pay to keep your options open over the night. That is called an overnight fee, and it’s something every broker charges. Why should I choose Markets.com over any other broker? The decision is obviously yours in the end, but we encourage you to at least consider Markets.com. We only list and recommend the best brokers for the European market on this site, and out of all the brokers we recommend, Markets.com belongs to the top tier. Their platform is easy to use, their selection is big enough to satisfy anyone, they have awesome customer service, competitive spreads, two trading licenses, and much more. What assets are available on Markets.com’s platform? In total there are over 2,000 tradable assets on the Markets.com MetaTrader platform which range from large currencies and exotic forex pairs, to stocks, exchange-traded funds, cryptocurrencies, and much more. Needless to say, there is something on the Markets.com platform for everyone. How do I start an account with Markets.com? We have written a detailed description of the process above that we suggest you take a look out. However, the registration process is easy. First, you will have to submit basic information about yourself, then you take a quick test to prove your financial knowledge so that Markets.com can evaluate your experience. After that, you need to confirm your identity, make the first deposit, and start trading. Note that Markets.com has a demo account that you can open if you feel like you need to practice trading before you deposit your hard-earned money. In order to verify your account and start trading, you need to submit to separate documents. First and foremost, Markets.com wants a copy of your passport, driver’s license, or national ID. Second, they want a copy of a recent utility bill or a bank statement that shows your address. This is done in order to prove that you are who you say you are so that Markets.com can start offering you financial services. Is there a Markets.com demo account? Yes, as a matter of fact, there is. Markets.com offers a demo account to everyone who is interested in trading in a risk-free environment. The demo account is completely free and unlimited meaning your balance of virtual dollars get refilled automatically when needed. It’s a great way for beginners to get some much-needed practice and a great platform for experienced traders that want to work on developing strategies. Does Markets.com offer their own platform? Yes, Markets.com has developed their own trading platform that they offer in combination with MetaTrader tools. Instead of creating a trading platform, Markets.com opted to offer the MetaTrader 4 which happens to be the most popular forex trading platform in the world. However, in order to offer access to more markets, Markets.com upgraded to the MetaTrader 5 and after that, they also developed their own platform. All the platforms are easy to use, hugely popular and have been adjusted to fit Markets.com’s brand in a very sleek way. It also comes with a range of practical charting tools and analytic properties. Personally, we love trading with the MetaTrader tools and so do tens of thousands of other professional day traders. Can I use Markets.com on my mobile device? Yes, Markets.com’s trading platform comes in a mobile-friendly version that offers all the tools one could need and would expect from a mobile trading platform. It’s available on both Android and iOS which means you can trade using all of the most common smartphones and tablets including iPhone and iPad. We have used the Markets.com mobile platform a lot and can assure you that it’s highly effective and easy to use. Markets.com has support for a range of different payment methods including credit and debit cards, online payments such as PayPal as well as regular bank transfers. Depending on where in the world you live there might even be some smaller local payment methods that you can use. Since Markets.com is a regulated broker they can’t offer any payment methods they want and their selection is similar to other regulated brokers. For a full list of payment options, we refer you to the review above or Markets.com’s website. Is there a deposit limit? Markets.com does have a few limits regarding deposits, but they depend on your level of knowledge about the market and finances as well as where in the world you live in. It can also be affected by the payment method you choose. Because of this, we suggest you open an account to see what limits Markets.com will offer you. The minimum amount needed to start an account is $/€/£ 100. How do I withdraw my fund from Markets.com? You have to decide on which payment method you want and how much you want to deposit and that’s pretty much it. For most payment options, Markets.com wants you to withdraw your money to the same account that was used for your deposit. When do I get my money with Markets.com? All transactions are handled by Markets.com within 48 hours of them receiving it. However, the actual transfer might take longer, and it all depends on the method you used and the bank that’s in charge. That being said, Markets.com will do everything in their power to make sure that you get your money in a timely manner. Can I trade cryptocurrencies with Markets.com? Yes, or no, or sort of. You can’t buy the cryptocurrencies from Markets.com just like you can’t buy actual stocks from them either. Instead, you can use their platform to speculate on assets and their prices. That means you can invest in the price of Bitcoin or any other cryptocurrency but you won’t own the asset. To learn more about how this system works, we suggest you check out our comprehensive CFD trading guide. Or you can open a demo account with Markets.com and test it out for yourself. There are many benefits to trading CFDs compared to buying securities, and we always recommend that you weigh your options before you start trading. Does Markets.com offer leveraged assets? They do, just like all forex and CFD brokers. Leverage is a method used by traders to increase their investment power and increase their potential profits. All forex and CFD assets are leveraged by default, although you can usually decide on how much leverage you need. That being said, leverage and margin can be used for other types of trading as well. Note that leverage increases the potential profit as well as the potential risk and you should not trade leveraged assets until you understand how it works. If Markets.com wasn’t a safe broker that we trusted ourselves we would never recommend it to our readers, it’s as simple as that. Now we understand that you don’t know us and you might be hesitant to take us for our word but don’t worry because we have more proof that Markets.com is safe. In order to legally offer CFD and forex trading in Europe and elsewhere, a broker needs to be authorized and licensed by an acceptable financial regulatory body. One of the most respected authorities in the industry is the Cyprus Securities and Exchange Commission (CySEC) from which Markets.com has a license. In addition, Markets.com is also regulated by the South African trading authority. Not really. Markets.com’s main focus is the European market, and due to their South African certification, they are also quite prominent in Africa. In addition, the platform is available in some countries in Asia. In other parts of the world, CFD trading is forbidden or requires a certain license that Markets.com doesn’t have yet. For example, in the United States, Canada, and Belgium CFD trading is not allowed and in order to offer CFDs in Australia, a broker needs a license from ASIC (the Australian Securities and Investment Commission). Similar to most brokers, Markets.com offers its customers a substantial library with written and recorded trading tips for every level of experience. For example, you can learn about using stop-loss and risk management, different assets, the MetaTrader 5 platform, etc. Lately, the broker has started focusing on something a bit different that most brokers don’t offer and that is webinars. In these webinars, you get to participate in live videos where experienced traders help you get better at investing and developers teach you tricks to use with the tools. Often times you get to watch more experienced traders trade live with commentary, which we think is the best way to learn. What is impressive is how many of these webinars they host. At the time of writing this (June 2018), Markets.com had 7 webinars planned for the coming months with topics ranging from “Live Trading” to “The most important indicators for your trading.” Also, all of the planned webinars we could find were free for registered members. opinion. However, we want to emphasize that all of our reviews are written objectively and that we don’t hesitate to speak our minds on things that we would like to see improved. In the case of Markets.com, there are a few things we would like to see them fix. The main issue is Markets.com’s website. It is surprising how lackluster it feels to Markets.com’s competitors. Also, the Swedish, Norwegian, and Danish translations are bad to a point where users might be deterred from signing up. Even if you use the site in English the navigation doesn’t work as it should, menu items are stacked on top of each other, and the overall feel of it is cheap. Hopefully, this is something they will look into and we are confident that they could fix it in no time considering how well-designed their back end and platforms are. In their defense, the design is more forgiving on a mobile device than in a computer browser. We also think that the broker could be more transparent with the fees and charges so that the client knows what to expect. It took us quite some time to figure out what the fees are and what their terms include. To us, it’s just common courtesy to share this information with users since they’ll have to figure it out at some point anyway. What do experts think of Markets.com? “I knew about Markets.com before I ever started focusing on CFD trading and I remember how everyone praised them. Later on, Markets.com happened to be one of the first brokers that I ever made a detailed review about – not for professional purposes but in order to educate myself on the market. Markets.com was actually one of the first brokers I traded with, not the first, but definitely one of the first. I still remember their platform to be quite an old school, but with a great demo account. Today, I would argue that their platform is one of the best out there, simply a great product. Clean and easy to use. Also, they offer a good amount of assets, cryptocurrencies, and leveraged trading. I still trade with Markets.com on occasion, and that’s a big deal. Most of the old school brokers out there I have deactivated my account with. As always I would recommend that you make use of the free demo account, especially if you are new to trading or to markets.com. And oh, let us know in the comment section, user reviews are always fun to read. Lastly, I would recommend reading other reviews on our site before you make up your mind. Jimmy Norin, CO-Founder of BullMarketz. We’ve spent years working in this industry and have reviewed and traded with a long list of forex and CFD traders during that time. Unfortunately, most of them are not even worth mentioning. But then there are some brokers that stand out and leave a professional imprint from the first moment. And guess what, Markets.com is one of them. Not many brokers have the ability to impress us as Markets.com does, but they do every time. In the end, what makes Markets.com different from so many other brokers is a combination of things. It’s their world-class platforms that have gotten better and better each year that we’ve used them, it’s their drive to stay relevant and innovative, their professional customer service, and that they have a solid selection of tradable assets. We are obviously not alone with thinking this either, considering all the awards and recognition the broker has received over the years. And we’re pretty sure that the majority of Markets.com’s 5 million registered users would agree that this is one awesome broker. I have been trading at markets.com since I started daytrading, I am a friend of the team at BullMarketz and they asked me to provide a user review of markets.com. I will be glad to do so. Markets.com is one of my favorite brokers and has been since start, so I might be a bit biased towards them. I just want to make this clear. Why did I choose Markets.com? Well, it was actually pretty random, back then there was not nearly as many options as right now and to be fully honest out of the options that I did have I literally picked one at random. Now, I have tried several other brokers over the years but I always end up coming back to Markets. Why? Simply because I like their product, they have OK fees and they provide just the right tools for me. There are many brokers with more advanced functionality, sure, but I am not a guy who is looking for the most advance functionality. I have my methods and strategies and I am a successful day trader. Throwing a bunch of new tools into the mix will most likely just hurt my profits. They are safe to trade with and anyone claiming that they are a scam are most likely just bad traders. Fully regulated of course. Is markets.com the right option for you? I have no idea, that depends completely what you are looking for. Try to make up your mind on what you are looking for in a broker and you will be able to know if markets.com is the right choice for you or not. I can share one thing about today’s trading environment and that is that you can find so many brokers today that you can cherry pick a broker that suits your needs completely. And many thanks for submitting your user review, our clients will most definitely find it to be useful. And for anyone else who wants to drop a comment, feel free. We want this place to be a source of users reviews and opinions on all the brokers we list. Where can I read more about the fees for Markets? We have a section in this review called “Markets.com Fees, Spread, and Commission”, there you will be able to find all information you need. All fees are included in the spreads with markets.com, which we think is great. Find the exact numbers in our markets review. Markets.com is a good alternative as they are regulated, I used another broker long time ago that was not regulated and I lost all money I invested.. but you are right in your review, markets is a good option. I would like to buy bitcoin and ethereum.. is markets.com a good option for this? Looking at markets.com now I am sure they improved, I just checked their website out and they have a new and improved design.. looks like they stepped their game up a bit. I remember just a couple of years ago this broker was not that good.. I am sure they are safe since they have the license.. I might actually try to open a demo account..
Hi Calvin, and thanks for your comment. Markets.com has indeed upped their game, their new website is much easier to use than the old one. In fact, Markets quickly became one of our favorite brokers. In fact, we believe that most brokers need to make this kind of developments. I am suprised to see a lot of reviews on bullmarketz with user comments about problem with withdrawals. I have traded with markets since august 2016 and I have never had any problems with taking my profit out.. I would give markets.com 4 out of 5 in score but you need to be aware of the risks with cfd trading, its not for everyone and please make sure you know what you are doing.. if you dont know then start with a demo account and dont waste your money..
Our experience is the same, we never had any issues withdrawing money from markets.com. In fact, they are one of the fastest brokers when it comes to processing payments. So I got quite some story to tell about markets.com… this has been cleared up now and I got my money back.. but it was stressful for me to be in this situation.. My friend and I invested over 67,000EUR each in Markets.com and we lost everything, they gave us nothing. I had over 56,000EUR interest and all they did when I made a withdrawal request was close my account. I reached out to my account manager he told me to deposit more money and I refused. He stopped responding to my calls and emails. Eventually, I heard back from them and I got my money back, though it took quite some time..
My account had been under investigation, and I never really understood why.. there was no suspicious activity on my end. I am based in the UK.. Just thought I should share my story..
And thanks a lot for sharing your story, we are happy to hear that you manage to sort out your situation. Is this broker still a good option for trading? Yes, Markets.com is still a great option, in fact, we recently started recommending markets.com as #1 on bullmarketz.com. You can always trust that we are keeping our review up to date in order to guarantee that we are displaying correct information. I was wondering how up to date this markets review is? I have been looking at a few brokers and markets.com is one of them.. are they still good? Our markets.com review is definitely up to date, and yes, markets.com is still one of our favorite brokers.